Speaking at 9th anniversary of the water utility in Kathmandu on Sunday, representatives of four trade unions of KUKL demanded that Chairman Basnet step down saying that change in leadership is urgent for managing distribution of Melamchi water efficiently. Tejendra Jung Karki, an employees' leader, said that all employees want Basnet's ouster from the KUKL board as he has been in the board, representing Nepal Chamber of Commerce (NCC), since the utility's formation in 2007. NCC holds 9 percent stakes in KUKL. Likewise, other employees' leaders like Nawal Singh Saud, Bishnu Prasad Aryal and Bipin Shov demanded that Basnet make a graceful t exit from KUKL. KUKL has been in a sorry state in recent years both due to increasing political intervention and highhandedness of Chairman Basnet, raising a serious question on the capability of the organization to distribute Melamchi water which is expected to reach Kathmandu later this year. Basnet was blamed for incompetence and irresponsibility by all remaining eight board members three years ago. They had even demanded ouster of Basnet from the board. The growing differences between Basnet and other board members have spilled into the Supreme Court. 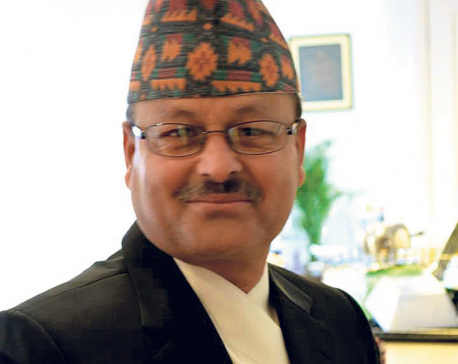 Basnet, who deferred hearing in his own petition for about 18 months, has managed to reach a settlement in mediation. But many see it as a move to seek continuity in KUKL top post. Bhim Prasad Upadhyay, secretary at the Minister of Water Supply and Sanitation, organized a meeting of KUKL board members to resolve differences among them. It is after the meeting that Basnet requested the Supreme Court on Friday to withdraw his case. “The entity has been taken hostage by private institutions because of a faulty shareholding structure which gives private sector four seats in the board for a mere 15 percent ownership. Entity holding 30 percent of shares has only one representative in the board,” union leader Aryal said. Speaking at the program, Basnet said the Asian Development Bank was trying to oust him from the post. Stating that he had supported ADB while instituting the agency some nine years ago, Basnet said intervention by the lending agency is unfortunate. At the program, Basnet made a commitment to do some soul-searching on his previous weaknesses. Minister for Water Supply and Sanitation Prem Bahadur Singh has directed the management of Kathmandu Upatyaka Khanepani Limited to publish water supply schedule within a week. Though water supply in the Kathmandu valley is irregular, KUKL has not bothered to publish water supply schedule. Minister Singh also asked the KUKL management to investigate water leakage and theft, ensure smooth water supply, and collect outstanding dues. “The KUKL management should set up an information center and deploy mobile teams to listen to consumer's woes round the clock,” he said, expressing commitment to make public a concrete work plan to manage water supply in Kathmandu Valley very soon.